Even though Philly Beer Week has ended, Philadelphia continues to celebrate beer on a daily basis, and beer writer Don Russell has written a guide to drinking in his hometown. 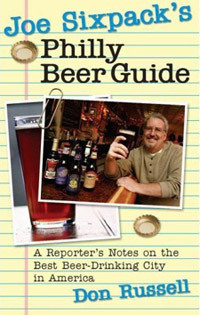 “Joe Sixpack’s Philly Beer Guide: A Reporter’s Notes on the Best Beer-Drinking City in America” cites more than 300 places and is thick with maps and photos. The book has already earned enthusiastic endorsements. “. . . useful information bulges out of this book,” Lew Bryson writes as Seen Through a Glass.